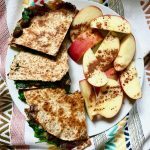 About a year and a half ago when I transitioned to a new NP job in New York, I learned something new in this intuitive eating journey. I was now working in primary care so I saw a bit of everything, but a good amount of our patients were in treatment for an eating disorder. 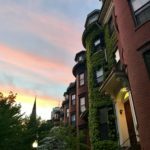 The physician I worked with had become the primary referral for outpatient RDs and eating disorder treatment centers in the city. That job was the perfect fit for me in many ways and I learned so much. In primary care, there are many visits from pharmaceutical reps. So about once a week, sometimes more, we’d have a pharmaceutical rep come in and talk to us about a new medication or diagnostic test in hopes of us integrating it into our practice. As a thank you for allowing them to take your lunch hour, pharmaceutical reps bring in lunch for the whole clinic. I love free food! But usually what free lunch entailed was cheese pizza. Almost every time. I completely realize the privilege of free food, and access to food in general, and I’m thankful for that. I realize not everyone has that privilege. For the first few months in this new job, I would eat the pizza instead of my packed lunch. Usually, I didn’t know when we’d have reps come in during lunch so it was a toss up. The first couple times were no big deal. I didn’t realize the frequency of these lunches at the time. Not every food experience is going to be 100% satisfying. Trust me, my packed lunches were nothing to write home about. I also love pizza and eat it often. But $1/slice, greasy cheese pizza did not leave my stomach feeling great. Plus, it did nothing for my energy levels in the afternoon. It wasn’t the gluten or dairy that was the problem like diet culture makes us assume. Most, if not all, of my packed lunches have gluten and dairy. Rather, it was the quality of the food itself and the lack of vegetables. My body just preferred and felt better eating other foods for lunch. The pizza tasted fine, but I didn’t feel great going into 5-hours of seeing patients after lunch. Looking back, I didn’t really think much of this for a while. I ate the the pizza, didn’t feel awesome and went on with my day. I didn’t prefer it, but it was what it was. But then I realized…oh, I’m actually continuing to eat this pizza because I feel like I need to prove a point. Here I am, a dietitian and nurse practitioner who’s practice philosophy is strongly rooted in IE and HAES. Not to mention, I work at a clinic where we care for many patients with eating disorders. I needed to show that I eat ALL THE FOODS, ALL THE TIME, NO MATTER WHAT. But consequently, I wasn’t being intuitive at all. I was eating out of fear of what others might think. And in turn, I wasn’t caring for myself. I think what can sometimes happen in the IE/HAES world is that we get scared of emulating diet culture, even in the slightest. Or we get scared of making nutrition recommendations to help someone eat in a more nourishing way that we end up being un-intuitive. That’s not a word, I just made it up. And what good is that doing? 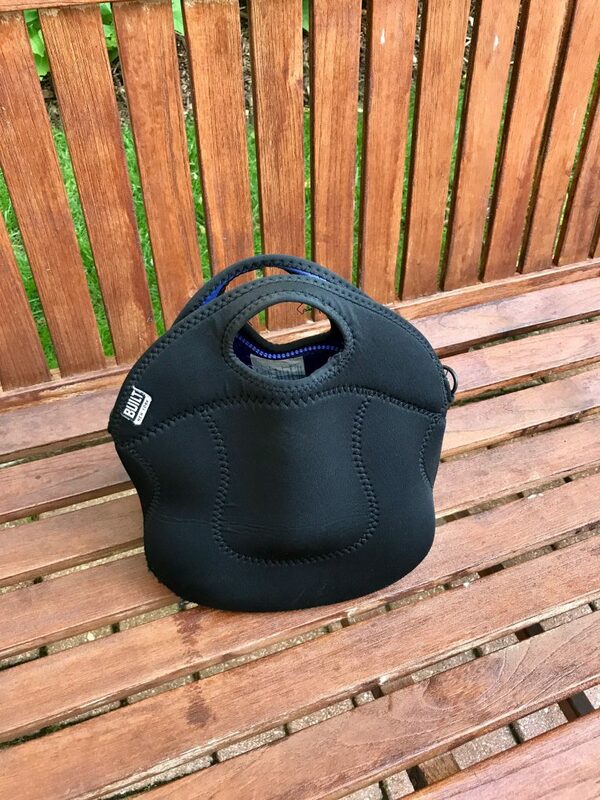 Avoiding my packed lunch that was full of foods that satisfied me and made me feel good because I wanted to prove a point was far from intuitive. Or even normal eating. 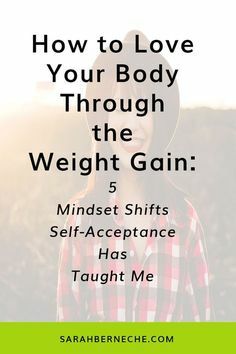 If you’re new to your IE journey or in recovery from an eating disorder, what I’m talking about in this post might not be where you’re at in your journey quite yet. That’s totally okay. You’re right where you need to be. 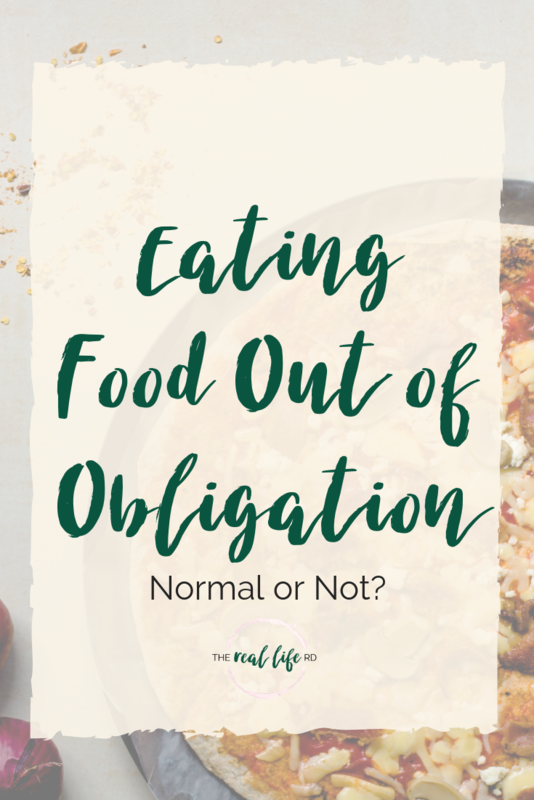 If you’re well settled in your IE journey and perhaps have even moved from intuitive eating to normal eating – you can probably relate to an experience where someone has offered you a food in a pressure filled way when you really didn’t want it. And when I say, “you really don’t want it” I mean you’re feeling 100% satisfied, full, and truly do not have an appetite for that food. That’s different from fearing that food or even being afraid of getting overly full. Sometimes being overly full actually enhances our food experience. Is this part of being an intuitive/normal eater? So is part of being an intuitive/normal eater just taking a food being offered and eating it no matter what? Is it eating that food even though it might not make you feel physically well? Or eating food even though you’re full and you know feeling a little uncomfortable isn’t going to enhance your food experience? I don’t think there’s a black and white answer here. Perhaps sometimes it is part of IE/normal eating. Like those infrequent pizza lunches at work. We don’t need to overthink food. But on a repeated basis, I think that’s when we can take a step back and do some self-reflection. In the same way we can choose not to eat foods out of fear, we can also choose to eat certain foods out of fear. The former is usually out of fear of what might happen to our body. The latter is usually fear out of what others will think of us. I fell into the second camp. In both situations, we’re not attuning to our own needs. After realizing what was really going on in my head around the pizza, I also realized that I could go to the meeting with the pharmaceutical rep at lunch and eat my packed lunch. By doing so, I was eating more intuitively. More normally. There were days where I did eat the pizza because 1) my packed lunch sucked or 2) pizza sounded good or 3) taking advantage of free food never hurts the wallet. And there were times we had baked goods brought in by patients and I enjoyed those with my co-workers. Nobody said anything. I have no idea what they were thinking or if thoughts did cross their mind. Maybe they did, but probably not. If they did, that’s understandable. We are all living in diet culture so we have judgements that will come up (either consciously or subconsciously) around other people’s food choices. Those thoughts that come up for us have nothing to do with that other person and everything to do with us. Me eating my packed lunch was me eating in a way that felt best for me – physically, emotionally and mentally – and that’s what mattered. There’s a lot of nuance with food and with intuitive eating. It’s going to look different from one person to the next and that’s how it’s supposed to look. I’d love to hear your thoughts in the comments! Also, we have a couple spots left in our intuitive eating support groups that start next week. Our final two groups of the year! You can live anywhere and the group is held on a video platform so you can be in your jammies on your couch. If you’re feeling stuck, alone, frustrated, lost or confused, we’d love to have you join. You can read more about the groups and hear what post participants have to say here. Email us at [email protected] to grab one of those last two spots! I really loved this post! I just had a similar experience. I am getting deeper into intuitive eating and goodness it is a process and learning experience completely! As a dietitian, the longer I’m in the field the more exposure I have to comments on what I eat, how I eat, my activity etc. 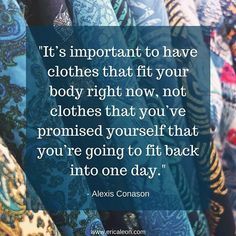 Things that I used to never think of and were normal are all of sudden huge thought processes because the amount of comments I have now heard about my eating. The other day at a meeting there were cupcakes for an employee’s birthday. We are all in the diabetes department which adds to it seeming like a “big deal” to eat cupcakes. Anyway, they asked if I wanted one and I had to think about it a long time. I could tell everyone was wanting to know what the dietitian would choose. Really the reason it was kind of hard for me to decide was because I love sweets, everyone was taking part, and I could see everyone was curious at what I would choose. I had to stop and really think “okay, do I really want this?” It was SO HARD to figure out if I wanted it because I really wanted it or if it was to prove I can eat any food I want. I ended up saying no because it was 11:15 am. Not my ideal time for cake. It was also a store bought vanilla or chocolate cupcake which is also not really a favorite of mine. It made me sad though when everyone started saying I was being “good.” They also started talking about how much they needed to exercise after this and they were “bad.” I tried to explain a little that it wasn’t being good. I just didn’t want one. Sorry for the long post. haha I really enjoy your thoughts though. I so hear you Bre! It can be really frustrating to have other’s judgements around food be projected onto you, but we are all swimming around and drowning in diet culture so in some sense it makes sense unfortunately. Hi Robyn, I wrote you an email about a situation I was in that relates very much to today’s post. Thank you so much for addressing this. The distinction between eating out of fear and not eating out of fear was super helpful. As someone who’s newly on the recovered side of things (and wants to “prove” how far I’ve come/not worry loved ones/be normal), this is something I’m learning to navigate. I appreciate the context you give and how this applies in your own life too! You’re so welcome! Thinking of you as you navigate and know that it is one big huge learning journey! 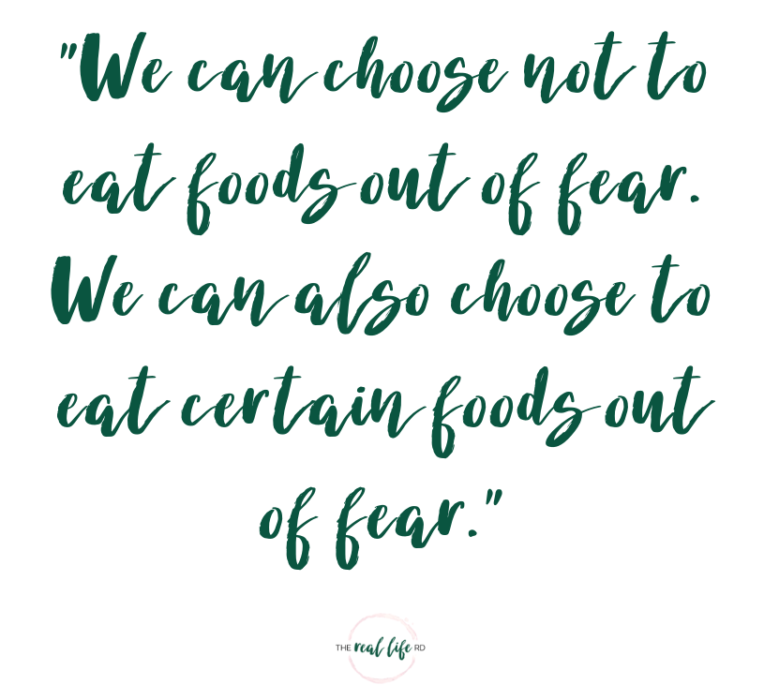 Robyn, I love the way you framed this idea — that we can choose to eat certain foods or choose to not eat certain foods, but both of those actions can be motivated by fear. “In both situations, we’re not attuning to our own needs.” WOAH. That was convicting and helpful for me. It challenged me think about I am cultivating a heart that is movtivated by love of self and others, rather than motivated by fear. That goes for my relationship with food, and so many other choices in life. So grateful for your voice and your thoughts! 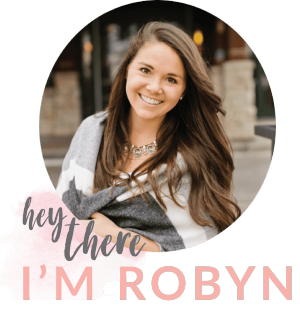 Robyn – your posts are always straight on! I am not where I want to be yet with eating intuitively but I do feel strongly about not eating to please others. It is a complicated, messy journey for sure! I completely relate to Bre’s comment above – I think the office is one of the worst places as far as diet talk goes. Robin, thank you so much for this post! Really insightful and it affirms a lot of things that I’ve been thinking and feeling but haven’t been able to articulate. So glad it was helpful Beth! I love this post! I have had this come up a lot in my recovery…mostly around my family. I feel obligated to eat the dessert, drink the latte or partake in an appetizer so they don’t think I’m engaging in ed & get worried. A lot of the time I DO want the food but sometimes I feel like I don’t have the option to say no. On the other hand sometimes it’s still hard for me to know if I am acting out of eds preference or my own. So tricky! Yes! Not totally related, but I’ve been working at Tatte for about a year, starting when I was just coming into “life after ED”.I believe that it was hugely helpful for me letting go of food rules and rediscovering and accepting my sweet tooth. For months I rarely had pastries, only if I ever really wanted them and often brought my own healthy snacks of fruits and nuts.. As I increased my hours after the school year, I started eating more pastries, probably through a combo of being there more often, seeing my coworkers also eating pastries daily(but not knowing their thoughts or physical feelings around it) and being too lazy to bring as many snacks. It’s so hard to say no to free food and of course I’ll eat the broken cookie that we can’t sell and would otherwise end up in the trash. And I need to know what they taste like to sell them. But I’ve had to learn that I feel kinda blah and lethargic and gross if I eat too many, even if I eat lots of other veggies and exercise throughout the day/week. I’ve also had to endure diet talk there “what’s the healthiest thing” “I’m being good/bad” or “I could never work here, I’d gain so much weight”. It’s easy for me to joke that I did gain a lot of weight in the year working there-but weight that I needed to gain! As someone who has worked really hard at IE/HAES, it’s hard for me to give a neutral reply. On the other hand, I am 120% guilty of judging people who come in asking for dairy-free/gluten free options. 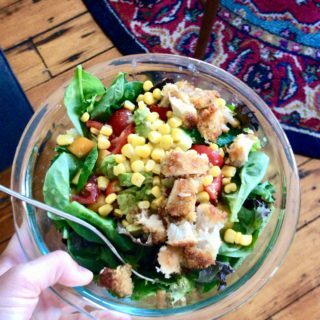 Are you ACTUALLY celiac or has diet culture talked you into it? Thanks as always for sharing your thoughts and experiences! I can so relate to this! 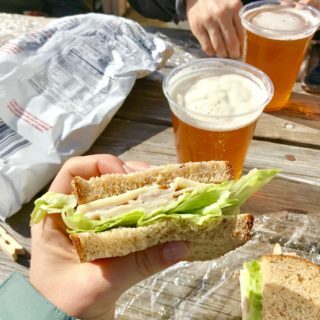 I’m an RD on a college campus working for the food service company and I have access to free food from anywhere, anytime. I’m frequebtly the only one of my coworkers eating a packed lunch and I have felt strange about that in the past for the same reasons you said. I don’t want to fuel the stereotype of eating only “healthy” foods. But then I also want to feel good and eat satisfying foods. So now I don’t give it much thought. I have also eaten baked goods at work celebrations for that reason of not wanting to fit a stereotype. But that usually leads to an unsatisfying experience (I’m just not a big sweet eater) so I try not to do that anymore and only take a sweet if I really want it. People are gonna think what they wanna think regardless. Might as well do what makes me feel good. I found this post to be really spot on! People know me as the “healthy one” in my office and I often don’t eat the foods brought in for birthday celebrations simply because they don’t make me feel my best and keep my energy up throughout the day, and I would truly rather have the snack I packed from home. This post was also very timely – we’re having a pizza lunch tomorrow at work and I already packed my own lunch I’m planning to eat while I sit with everyone during the pizza party. I know I’ll get comments from coworkers but I’m past the point of where I will eat something that I don’t want just to avoid other peoples’ judgements. It definitely took me a while to get to this place, but I do feel confident enough in my own food decisions to not care what others think – I eat the “healthier” option if that’s what I want, and I “indulge” when it’s something I love and is appealing in the moment. 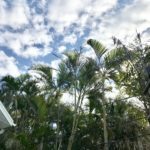 I also really appreciate you voicing these thoughts, as I have sometimes gotten the vibe that you want readers to know that you eat everything and anything, won’t ever say no to a sweet, etc., so I think this really shows the flip side of that too and how important it is to choose what makes you feel best physically/mentally/emotionally in each situation. this post, Robyn…spot. ON. when it comes to office/clinic/practice culture, this is absolutely so true and exactly what i’ve dealt w/ for years. i tend to be the one people comment about in regards to lunches (always packed, always a salad and sandwich. i’m boring but its so easy. ), so when the cakes, donuts, pizzas, etc etc come out and i actually take some there are comments. when i don’t there are comments. 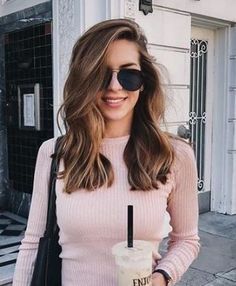 i certainly know no one means anything by it, but it just goes back to the diet culture and mentalities, ubere observations of everyone, no matter what they eat in their daily lives, are so ingrained in our minds. anyhoo, this probably made no sense, but you perfectly summed up this topic! Great post, Robyn! I work as RN, and there are ALWAYS sweets, snacks, and other foods of that nature around. There isn’t really that pressure to since it is available daily. We don’t often have surprise pizza or other meal food delivered to us, but when we do I have a slice of pizza and then maybe have it with the protein/veg/fruit I brought from home. I am still working on decreasing my restriction around food, so this method seems to work well for me right now. I have thought about this a lot, so I also appreciate this post! 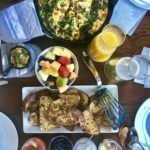 I would love a post that expands on this topic in regards to intuitive eating with family and/or boyfriends/significant others. My family of origin often eats meals at random times or meals are more simple carbohydrates that don’t fill me up for long. I’ve dated guys who love their pizza and beer and not veggies, which is no big deal every now and then but can be tricky meal after meal. This is a great topic-thank you! Thank you for sharing this Robyn! 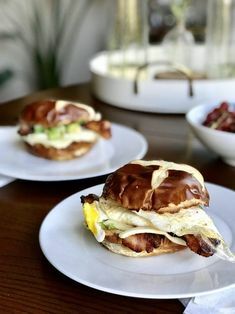 My husband and I are living with my in-laws right now and it’s been really hard to say no to certain food my MIL cooks, because I feel like I’ll offend her. But I really just don’t want it because I know I won’t feel great after. I feel like I’m living in a season where I’m faced with decisions like this everyday. This was very encouraging to read! – I’m so glad I’m not the only one.